Many years ago, in my wild eyed and bushy tailed youth (was it the late eighties, or the early nineties?) 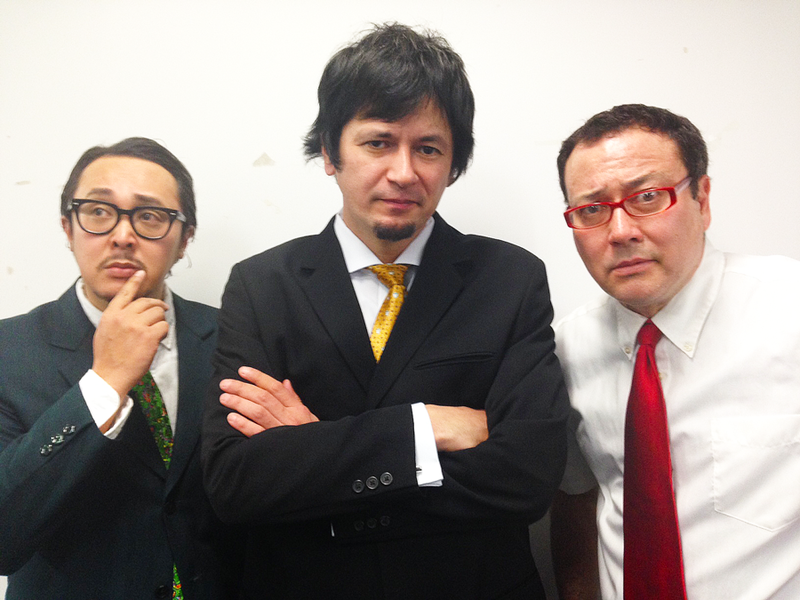 I was the director and co-host of a late-night smash hit radio show in Japan called, “Channel G” on InterFM. You can hear snippets of the Young Marquis and Stanley at the link above. Here’s a youtube for Frazier Smith. Hint: You can’t believe anything this guy says. Hilarious stuff! 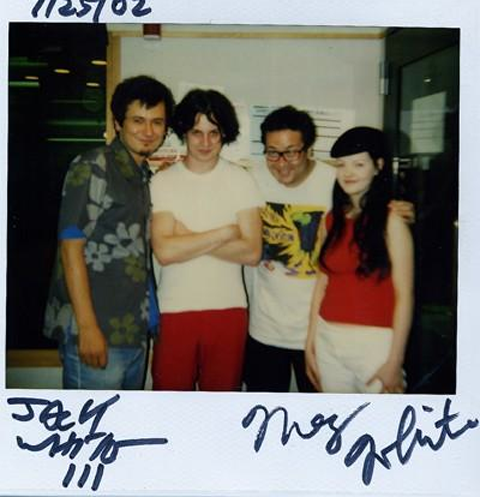 This is about a radical radio show I made in Japan called Channel G that was modeled after my favorites when I was a teen and early 20-year-old and it’s about the White Stripes (namely Jack White). Channel G played radical new music and alternative underground sounds. As with my show today, What the Funday, I believe it is my duty to introduce brand new music and brand new artists to the unsuspecting world way before anyone else does. To that end, we used to play a new artists that no one had ever heard of at the time. Some of those artists we played became really famous; most just faded to oblivion. One of those artists we did play that became huge, was a guy and girl duo called, “The White Stripes.” We played them constantly. One day, by some stroke of fate, before they were even remotely famous, the “White Stripes” came to the studio and were guests on the show. They were so thankful that we were playing them and that we allowed them as guests on the show. We were happy to have them! Anyhow, after the radio show interview, I got the chance to talk to Jack. I was pleased as punch. Thank god for punk rock! I’ve had several people in my life tell me that sort of thing. He asked me why we quit playing. 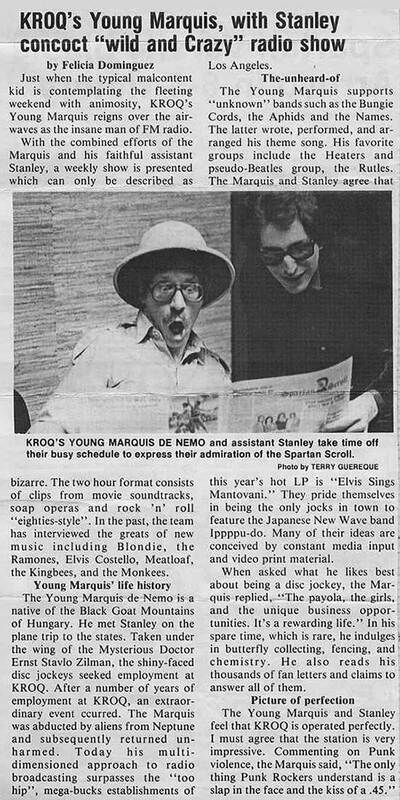 I told him about the band and how we were “one-hit wonders” and popular for about six months; we shot up like a rocket to quick fame in early ’79. But, as they say, what goes up must come down; we crashed to oblivion just as fast. I told Jack of my regrets. Seriously. They said that! Morons! That was effectively the end of our band; I will never forgive those two dimwits for that. But, I’m the biggest idiot in this scene, though. If I knew then what I know today, I would have kicked their lame asses out of the band right then and there on the spot. Then Phester (the guitarist) and I would have went to S.F. and played by ourselves. I would have stuck a bass guitar in a trash can and we’d have grabbed any drummer. But we didn’t kick them out and we didn’t go to S.F. Is that cool, or what? Thanks Jack White! What you told me made everything that had happened finally alright. At Robot55 we make video productions for businesses and services and products, but we also pride ourselves on making videos for art and music. 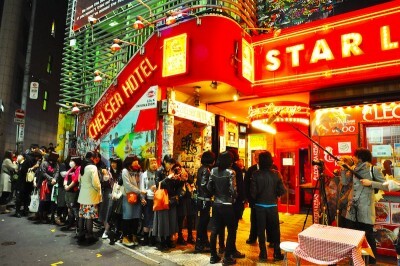 Our starting price is ¥70,000 and we are sure we can work out something that fits your budget. Oh, and we love making band videos too! 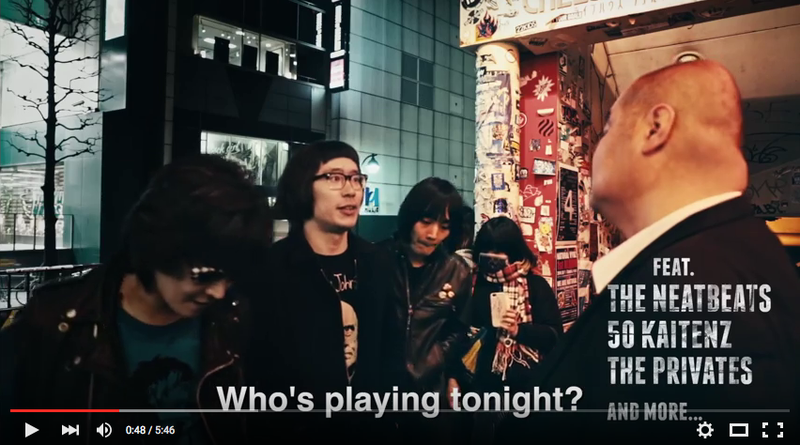 残すところあと２４時間（9月29日2015年に終了！）A Japanese Rock N Roll Ghost Story Crowdfunding Final 24 Hours! This is our crowdfunding last 24 hours. Thanks to all who have supported. To any others, this is our last chance! 今日9月28日（月）は最後の24時間。参加してくれました方、ありがとうございました。。。まだ参加していない人はLAST CHANCE! よろしくおねがいします！Let’s Rock N Roll! I started a Crowdfunding campaign in Japan on June 25, 2015. It is still going on. The campaign ends on Sept. 26, 2015. These are notes on my thoughts on what’s going on with this. I hope, if you are thinking about Crowdfunding, you can read this and, perhaps, learn a few things and it will benefit your efforts. When I started this project, I decided to try to get funding from some big companies. It’s impossible to make a professional quality movie without a lot of money so, over a span of about 2 1/2 months from March 2015 to Late May 2015, I went to several big music companies. The reaction from the presidents of companies I met was very warm and positive. Everyone knows that, since the Tokyo Olympics are coming to Japan in 2020, there is a golden opportunity to show the world the spirit of real Japanese Rock and Roll and not the J-Pop girls and boy bands that all the major labels try in vain to promote overseas. Three of the major companies offered me a lot of money. But there was a catch; the artists I started this project with – my team – would be replaced by pop artists. I can’t do that. 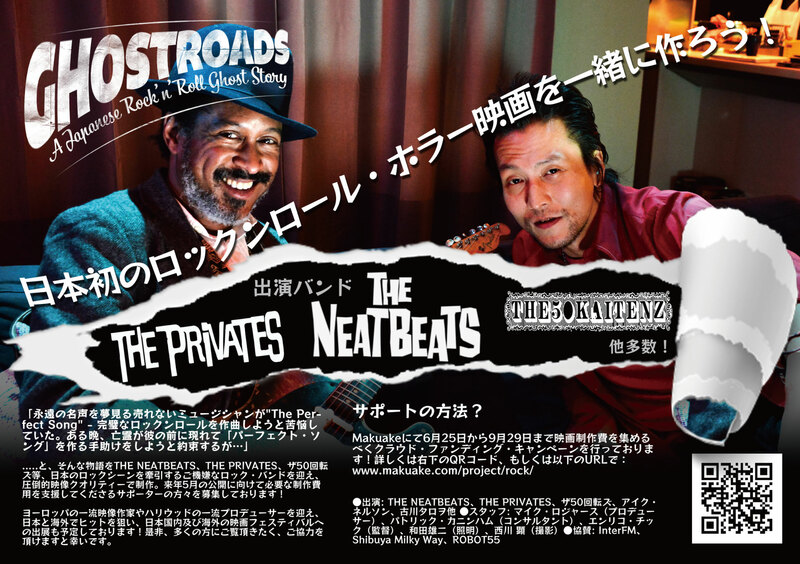 For one, the Neatbeats, the Privates and the 50 Kaitenz are my favorite Japanese rock bands. For two, they are my friends and my team (and one does not betray their friends and team! ), and; third, this is a rock and roll movie. I think that the spirit, the music and the love of rock and roll that these bands encompass, can be extremely popular overseas. I really do believe that. I believe in these bands. Finally, the last reason, I am an old punk rocker at heart and I have come to the conclusion that, in my life, I will never achieve major, mainstream success. This was a sad realization for me, but it is true. When my old and dear friend, Taro Furukawa said this to me, it was like an arrow through my heart, but I also knew that, deep down in my heart, he is right and it is true. So, I decided to not accept money from big companies and do this movie as an indie movie. Is it impossible? Sometimes I think so, but I must continue and push forward no matter what. But, during this time, Nobuhara san from the Privates said something to me that was really wonderful. He said, “We don’t need lots of money. We just need a punk spirit!” That was like a light going off in my head! Also, as a producer, it is my duty to make the best movie we can possibly make; I went out and got other professional people to help me. Everyone is doing this project as a volunteer and I am most grateful to everyone. Yet, it is my duty to make this the biggest happening and most successful movie that I can possibly make. That also means I have a duty to try to get as much money as possible and to pay all my people and team. About the money and the volunteers; thanks so much. I am trying to make this a hit movie (as much as possible) and to make it into a profitable movie. That means, that even if you volunteered to help us, if we make money, then I must make every effort to at least pay you for your time or, at least, train fare! So, please understand why I am so “pushy” on Facebook, email and Twitter. I don’t want to push so hard, but it is my duty to all the bands and volunteers and everyone who is helping us. A successful movie, like any project, is made by preparation. This effort (and Facebook, Twitter, etc.) is a part of that effort. Like I said, I don’t want to bother everyone constantly, but it is my duty and everyone deserves my best effort. I’m sorry if you think, “Mike is so persistent!” But I also hope you understand why and know that I don’t want to be so… It is a part of the job and my duty, to our bands, friends and volunteer, as a movie producer. You can’t really depend on the Crowdfunding companies to do any promotion for you. You have to do it yourself. The Crowdfunding companies all take about a 20% margin. Make sure that the company you choose includes credit card charges in that 20% margin. Our project is an “International Project.” I recruited a famous producer to help me. He has won at Cannes Film Festival and Sundance Film Festival. He has also been nominated for an Academy Award. I brought him in to give us reputation overseas. Big Problem: The Crowdfunding company does not accept LOTS of foreign credit cards. 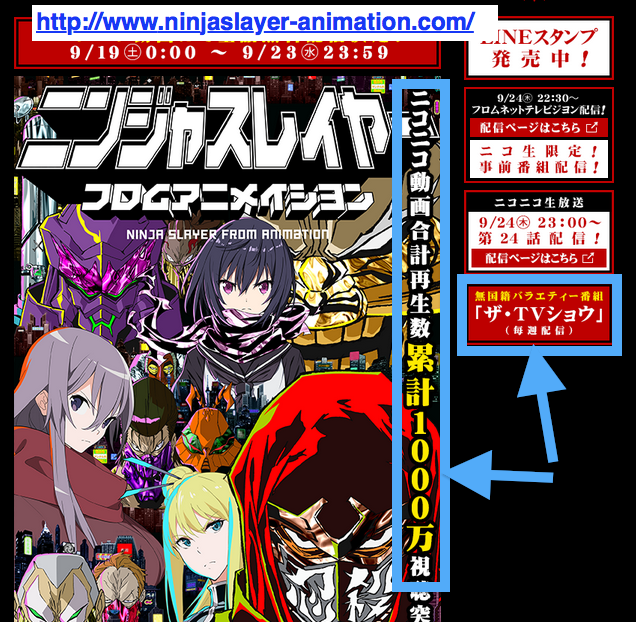 Our campaign lost over ¥500,000 because of this problem. I think it will take a long time for Japanese Crowdfunding companies to arrange foreign credit cards. The staff at the company I choose seem to be overworked. I can write them an email and sometimes do not get an answer from them for two or three days. That is not acceptable. This is the internet age; I expect an answer with a day. If it is an internet company (which the Crowdfunding company is) then I expect an answer within 2 hours. 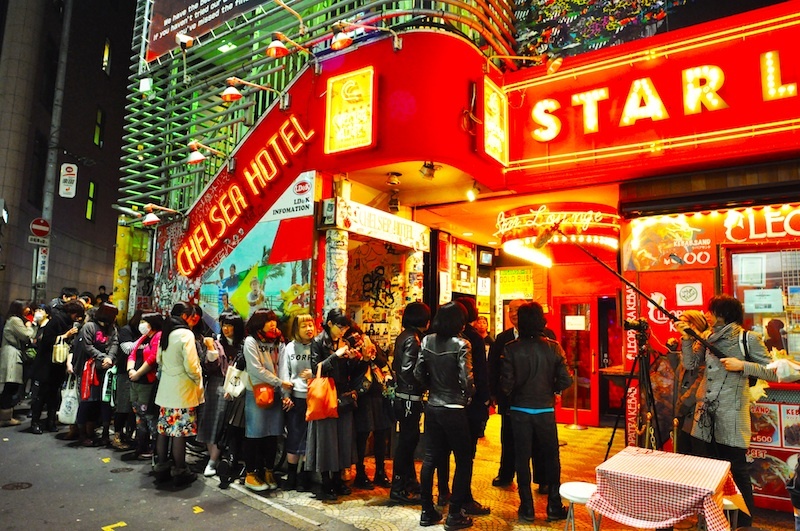 Crowdfunding in Japan, as of today, is still a relatively new thing. Lots of people don’t understand it. When our campaign started, I spent at least 6 ~ 8 hours a day, everyday, seven days a week for over three weeks sending out direct Facebook messages, Twitter and direct emails to all my friends and connections (No BCC!). I think that’s why we hit our initial money target within the first 15 days. If you do Crowdfunding, then you had better be prepared to do this same effort. Everyone will get sick of hearing from you, but you have a duty to the other people who are helping you. In early August, I saw a message on Twitter from girl that said, “On Facebook and Twitter, everything is ‘Mike. '” She wasn’t mad, but I took that as a message that people were getting sick of hearing about it. So I toned it down and basically did zero promotion during that month. Now that we are in our last few weeks, I have to start promoting again. Even if it kills me, we’re going to make this movie and it is going to be one the great memories of our lives for 2015 ~2016. Please forgive me for being so persistent. It is the bed I made, so now I must lay down it it. Thanks so much for your time and most kind consideration. In life I think you have to have punk spirit and you have to be persistent as hell!